It's a cold and snowy morning on a yet to be frozen Bierstadt Lake. I hiked into Bierstadt Lake this particular morning hoping the snow and fog might break at sunrise, revealing the snow coated peaks of the Continental Divide. Hiking in long before sunrise, I followed fresh Black Bear tracks in the snow to the east shore of Bierstadt Lake. It was cold and silent this morning as I waited for the sun to rise. I photographed these snow coated pines along the shores of the lake wondering where the Black Bear I had followed in had gone. 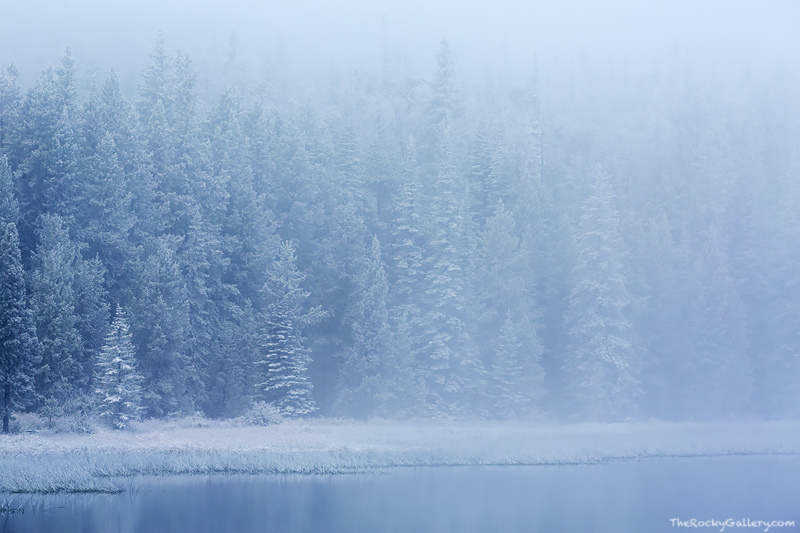 It was one of the most amazing and serene mornings I've ever had in Rocky Mountain National Park. Photo © copyright by Thomas Mangan.